Outdoor sports can have an impact on your body in a good and bad way. The good is getting your dose of exercise and fresh air. On the other hand, the bad part is unwanted calluses and bruises, but there is something that can help prevent this from happening. In order to protect your body from getting sores and cuts, you need something to protect your skin from injury. Protective gear is essential to any sportsman’s kit especially if that sport requires you to hold a club for long periods of time. Friction can cause uncomfortable calluses. Sportsmen such as golfers need to protect their hands as they’re holding and swinging clubs all the time. Not only do gloves protect your hands from injury but they’re also used to give you an extra sturdy grip on your golf club. So which products are the best to use? Continue reading to find out about the best golf gloves of 2019. 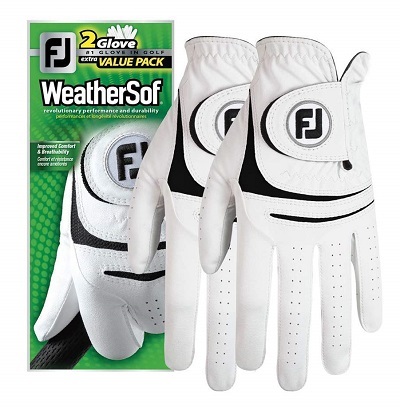 The FootJoy WeatherSof golf gloves are white in color with black detail for style. The fabric is soft with integrated breathable vents that prevent your hands from sweating on those hot days. For added comfort, the gloves are designed with dual PowerNet mesh inserts. 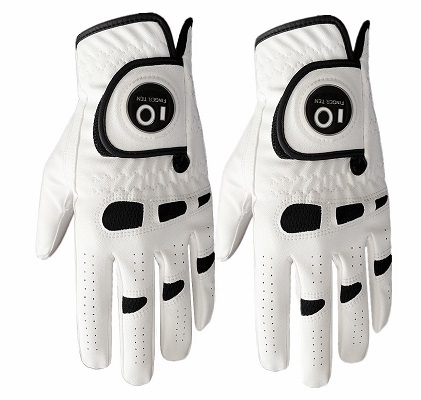 Golfers need gloves that are quick to remove and easy to put back on. The FootJoy golf gloves give you that benefit as they have soft adjustable wrist straps and a 3-Directional tab closure. With its non-slip fabric, you can keep a safe grip on your golf club at all times. 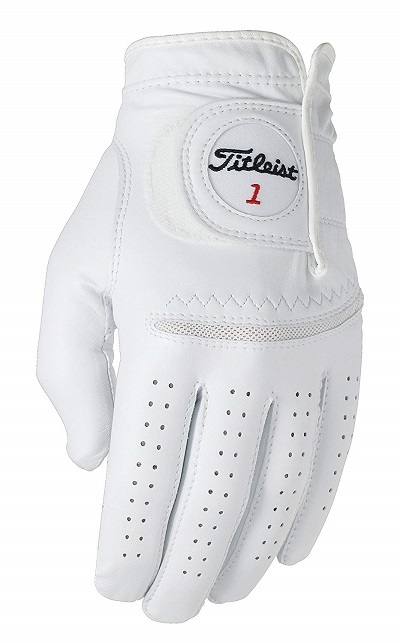 The Titleist Men’s Perma Soft Golf Gloves are white in color with an integrated CoolMax panel formed across the knuckles which allow easy movement and breathability. Titleist manufactures these gloves with a moisture resistant fabric so they don’t get soaked when it rains. Retaining a comfortable fit is important when playing golf as you don’t want anything to restrict your movement when swinging your club. 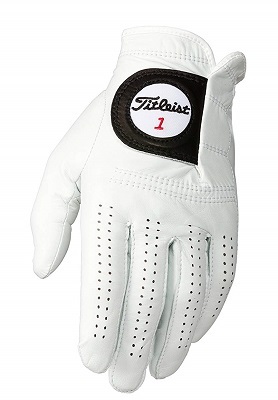 The Titleist golf gloves are comfortable with a close fit and soft padding to prevent calluses. The Cabretta leather also aids in keeping a firm grip on your clubs as well as when you’re carrying your kit. The gloves are made with a water and weather resistant leather which helps keep you dry on days when it’s raining. There are perforations for the palms, fingers and thumb for maximum breathability. 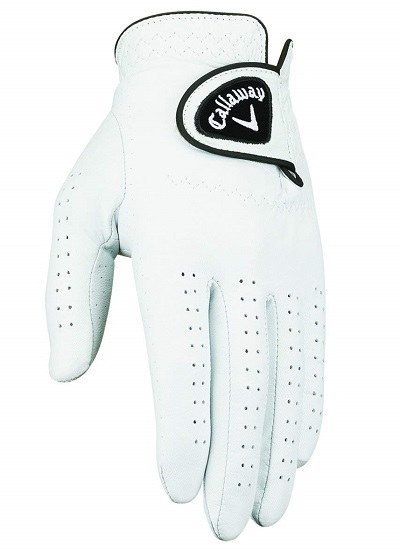 The Callaway Men’s golf gloves are white in color for some added style. The Callaway Men’s golf gloves are light in weight and thin making them feel like a second skin. For simplicity, the gloves come with opti fit adjustable closures which aid in taking the gloves off quickly when you need to. The adjustable strap also provides a secure fit. Made from a combination of polyurethane, nylon and goatskin the Nike Dura Feel golf gloves are high in quality & they’re durable so you can play golf games without them tearing. They also have integrated perforation to provide consistent airflow when playing. The stretchable material provides easy movement when swinging or putting. Nike Dura Feel VIII gloves have a slip-resistant design which helps you keep a firm grip on your club and aids in shaving off those strokes. With the affordable price tag that’s attached to these gloves, it’s definitely a bargain as you’re sure to have the best quality money can buy. 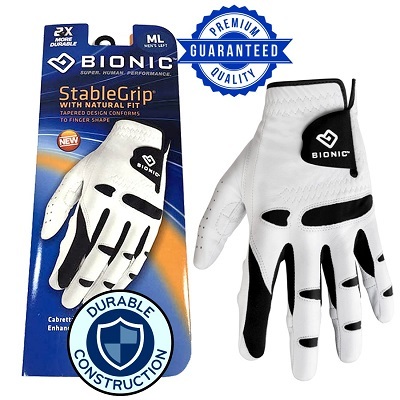 The Bionic StableGrip golf gloves have integrated pads located in between your finger joints. These pads aid in giving you the right amount of grip pressure and stop you from squeezing your club too tightly. You also get an enhanced index fingertip which helps with stability when you play. The gloves come with integrated moisture control for those days when your hands start to feel clammy. Gloves that don’t fit properly are more prone to wear and tear & it will be difficult to move your fingers. Bionic StableGrip Golf gloves are designed to fit snug on your hands without hindering your movements when you swing your club. The patented rotation finger design compliments the natural closure of your hand which reduces hand fatigue. Bionic StableGrip gloves are made with a washable leather fabric so you can clean them easily. Keeping your gloves clean prevents them from damage over time. Although the gloves are thin and light in weight, the constructed hypertec leather material ensures durability & a secure fit. The hypertec fabric helps you maintain your grip at all times especially when it rains. The TaylorMade Stratus Tech Gloves are designed with small perforations all over the body of the glove which provides you with 360° ventilation on those hot & humid days. The four-way stretch material provides flexibility and doesn’t restrict any movement in your hands. The unique lightweight design is slim and sleek with no added bulky straps that hinder your movement. 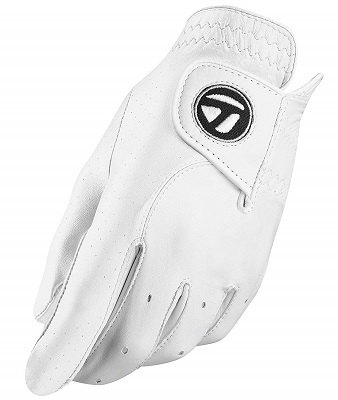 TaylorMade Stratus Tech are stylish golf gloves that provide a safe fit that doesn’t restrict the blood flow in your hands. With either a black or white design the material used for the Finger Ten is soft and manageable & allows you to play in all weather conditions. Made with high-grade Cabretta leather and with integrated padding it feels snug on your hands. The Finder Ten golf gloves have integrated spandex strategically placed so you’re able to move freely. There is also a fitted ball marker on the logo which aids in convenience with removing and replacing them. 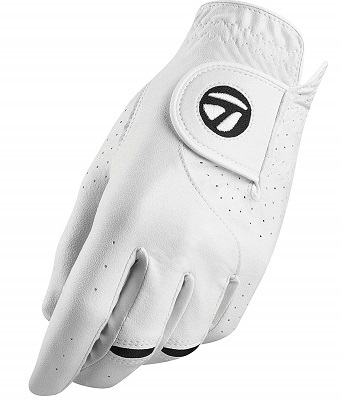 The Finger Ten Men’s golf gloves were designed to bring simplicity to the golf course. You’re able to use these gloves in any weather conditions and they keep your hands dry with their water-resistant fabric. Keeping your hands dry from the inside as well, the Finger Ten golf gloves also have integrated moisture control fabric for comfort and security. The Titleist Men’s golf gloves are made with premium soft Cabretta leather that comes in a white design for style and visibility. Perforation holes run along the fingers of the gloves to provide sufficient air flow. The Titleist logo is on the tab closure which makes it easy to see where to adjust the straps for a secure fit. Titleist makes the most comfortable lightweight gloves on the market, and with genuine leather they won’t tear or rip easily. They’re thin and well ventilated which is perfect for those humid days. The fabric is also stretchable which aids in flexibility and movement. If you want style as well as practicality then the TaylorMade Men’s Tour Preferred Golf Gloves are for you. These gloves are made from the finest Cabretta leather that comes in an all-white design. For breathability, there are strategic perforations placed along the fingers of the gloves. The integrated sweat bands keep your hands dry when it’s hot and humid & the contoured wrist lining ensures a secure fit. Through rain or shine the TaylorMade Men’s Tour Preferred Golf Gloves are designed for those professionals who spend most of their time on the course. They’re designed to withstand any weather conditions and to provide you with long-lasting comfort. 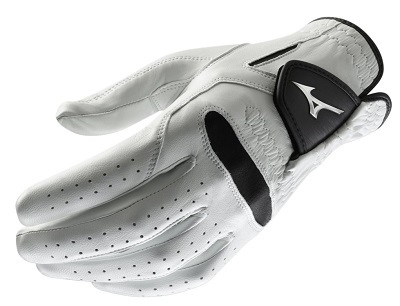 For a secure grip, the Mizuno 2018 Pro Men’s Golf Gloves are made from non-slip premium Cabretta leather and has integrated FlexMesh for easy movement. Perforation is placed along the fingers of the gloves for maximum airflow. The wrist strap ensures a secure comfortable fit. The contoured fit of these gloves ensures that you’re able to move your hands freely without restrictions. You can improve your performance without worrying about your golf club slipping out of your hands. The Mizuno 2018 Pro Men’s Golf Gloves are designed to withstand any conditions as they’re made from high-quality fabric. The stitching is also made with precision so the gloves won’t rip over time. The Mizuno 2018 Pro Men’s Golf Gloves come in all different sizes for all types of hands. Improving your performance is all in the type of gear you use. It’s important to have a kit that’s the correct build for your body and that’s why it’s important to purchase golf gloves that are the right size for you. 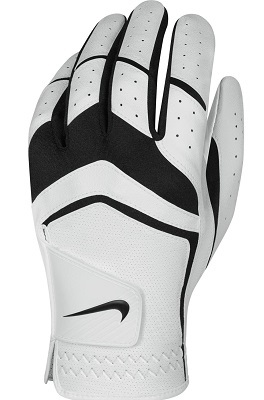 To add comfort, flexibility and a secure grip to your strokes we recommend The Nike Dura Feel VIII Men’s golf gloves. They’re made from high-quality material and they’re also inexpensive compared to other well known brands’ items. Protect your hands from injury and improve your game by getting your very own pair of golf gloves before your next game. You’ll love the difference it makes.